Who knew the Bennet sisters could look so badass? 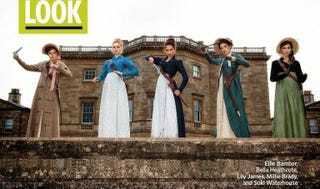 The very first picture from Pride and Prejudice and Zombies looks fairly ridiculous, which is the entire point. Call me insane, but I'm kind of excited about this silly movie. EW has premiered the very first image from the movie adaptation of Seth Grahame-Smith's adaptation of Jane Austen's classic novel. In this version, the Bennet sisters search for love and things to kill zombies with—because the English country side is just lousy with "unmentionables." And this image is exactly what I was hoping for. Don't forget Matt Smith, Lena Headey and Charles Dance have all been cast in this picture as well. As someone who has a lot of Pride and Prejudice memorized, I'm actually fairly excited for a silly horror tweak on the classic work. Just for fun.